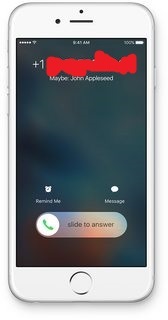 Many iPhone users after upgrading to iOS 11 are facing an issue in iMessage, call logs and Message apps that when they got a call from a number that is not saved in contact list but in the call log, under the number, a name is suggested: “Maybe: X”. The issue is seem all the time as users get a “Maybe:” in front of most iMessage contacts and only the phone number for SMS. This is not a bug or issue but an intended behaviour added by Apple as iOS scans your email for contact info. If the phone number is not in your Address Book, it looks to your email to see if anyone with this number sent you email. If it finds the phone number linked with a contact from your email, it will show you “Maybe:” with its guess of the person’s name. Under Contacts, toggle the switch labelled Contacts Found in Mail to the OFF position. This can also be a Siri Suggestion feature that can be toggled off at Settings > Contacts > Siri & Search > toggle off “Find Contacts in Other Apps”. Try to reset your iPhone network settings and location and privacy option- it should work instantly for you to fix “Maybe:” suggested contacts issue in iPhone. You may also resolve the issue by removing iCloud email from the Message setting option.